5-6 cups fresh parsley About 2 bunches. Leaves and tender stems, finely chopped. In a medium bowl, season chopped tomatoes and chopped cucumber with 1 teaspoon salt and toss. Transfer to a fine mesh strainer and allow to drain for 20 minutes. Reserve the strained tomato/cucumber liquid in a heat-proof bowl. After the tomatoes and cucumber have drained, heat the reserved liquid in the microwave until hot and boil some water in the kettle. Add the bulgur to the heated tomato/cucumber liquid and and add boiling water to cover the grains with about 1/2 inch of water over top. Cover the bowl and let stand for 20 minutes until softened. It's ok if it has a bit of firmness, it will continue to soften in the salad. Combine the olive oil, lemon juice, dried mustard and coriander in a jar and shake to combine. 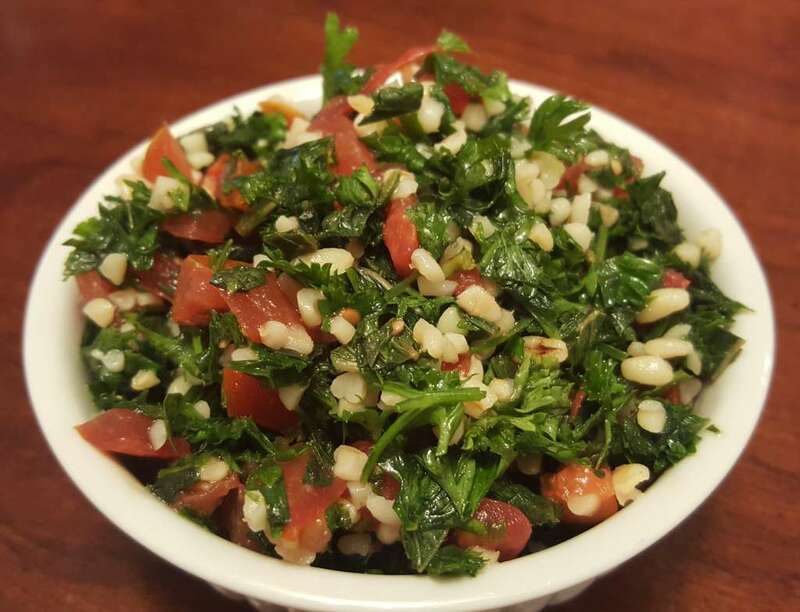 In a large mixing bowl, toss drained tomatoes, cucumbers, parsley, mint and bulgur with the olive oil and lemon juice mixture. Chill the salad for an hour or two before serving. Keeps well for one day in the fridge.